There are some things that you need to keep in mind when you are designing your website. For instance, your home page is the place to welcome and draw your ideal client in, while showing them that you are the best choice to work with for their needs. 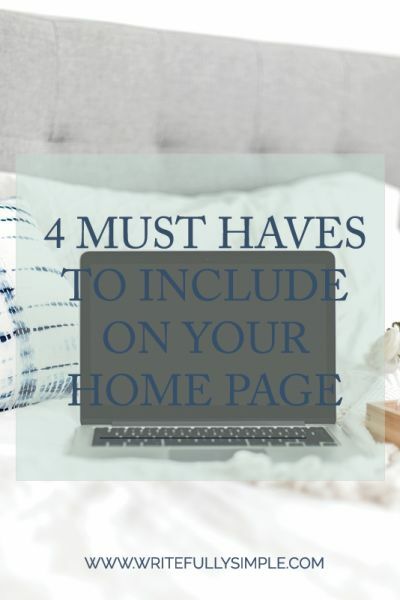 Today I am going to touch base on 4 things to include on your homepage to draw your ideal client in. A clear, short navigation menu. You want to make it easy for your visitors to find exactly what they want, and fast. No-one wants to search through drop-down menus to find what they are looking for. Keep your navigation menu simple, with 5-6 pages. A brief intro to who you are, what you do, and who you serve. You want to include your tagline or a brief paragraph that describes your business and the services and/or products that you offer and who you offer those things to. You do not need to go in-depth on your homepage as you can do that on your about and service pages. This will allow your visitors to know right away whether your business is right for them or not. A brief intro of yourself and your team. By including a picture of yourself and/or your team on your homepage it humanizes you and makes your brand more approachable than those that do not include pictures. Combine that beautiful picture with a brief introduction of who you are while pulling in your personality, and you will be able to build a connection with your visitors like no other! A call-to-action. When designing your website you should have a goal set for each page. Your home page should direct your visitors where to go to next – do you want them to book a service, enroll in a course, learn more through education, view your portfolio? Whatever the ultimate goal is for your home page it is important to guide your visitors right from the start so that they can easily find what they want and need from your business. Let’s work together so that we can make sure that you are set up and ready for success! Thanks Lindsay these are all super helpful tips!